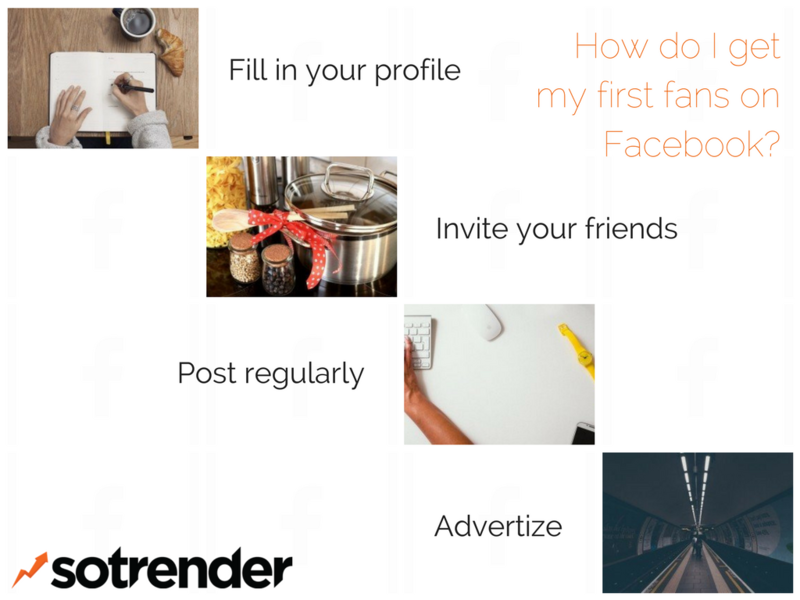 How do I get my first fans on Facebook? Getting your first fans might seem like a difficult task, but it’s quite easy. Just follow these steps and you’ll have hundreds of fans in no time. Make sure that your page is filled out with all the information your audience is interested in. There are some integral parts to fill in on your profile page. The more of this information that you have filled out, the more likes you’ll get. People won’t like your Page if they don’t know what your Page is about. Be sure that your profile will let them know. Remember to create your account in Sotrender app and verify actionable data-driven tips that will help you achieve your goals! Example of Sotrender’s data-driven tool tips. Your second step should be inviting your friends to like your page. Selecting the option to invite your friends will send a notification to them asking them to like your Page. If there are multiple admins on your page, get all of them to invite their friends to like the page. If you have profiles on other social media networks, you should let them know about your fanpage. And if you have a website, make sure to get a ‘like’ button widget installed for it. It will be an easy way for you to gather more Facebook fans, because all it takes is one click for them to become a fan. The first few days are important for establishing how your Page is going to post. So make sure to post regularly. Posting irregularly makes you appear less reliable and makes its harder for fans to know when to check out your page (check what you should post on Facebook and what time you should post). If you want rapid growth in fans, you can invest in advertising on Facebook. Remember that your target audience should be fewer than 100 000 people (read more about Facebook ads). If you want to specify your target, you can visit “Settings”, where in “Preferred Page Audience” you can customize your recipients.